Sitting in a large leather chair in the Smoking Lounge of the “new” Cloister, Sea Island Company Chairman and CEO Bill Jones III sends a billow of cigar smoke toward the ceiling and nods toward the rest of the room. “It’s like a London gentlemen’s club,” he says. The room, with ceilings crafted from rare pecky cypress, floors of heart pine and thresholds made from curly pine, is appointed with sofas and chairs of dark leather. It’s a clubby, masculine room that reflects a time when men gathered in such places to plot the course of an industry or a nation. A huge piece of pottery dominates the middle of the room; it’s a work of art Jones has owned and stored for years while waiting on just the right moment to bring it out. This is the moment. “History and tradition are important to us in everything we do,” Jones says. “We’re going to be mindful of our past; we’re going to respect our traditions, but our job is to build for the future.” And to build for that future, Jones had to raze the old Cloister’s landmark building, move the site 150 feet closer to the Black Banks River and erect – more accurately, resurrect – The Cloister. It will open officially to the public in October. The original Cloister, built in 1928 in the Spanish mission style, was never meant to be a permanent structure, but it had become a permanent part of life for generations of Georgia’s moneyed and socially connected classes. It also immediately grew a larger following throughout the world as a destination of choice for national leaders and occupants of the upper realms of celebrity. Two months after the hotel opened, the president of the United States, Calvin Coolidge, showed up for a photo op, planting an oak tree on its south lawn. Interestingly, Silent Cal was handed, and planted, a water oak instead of the originally planned, much hardier and longer living live oak, and the Sea Island landscapist had to sneak onto the grounds in the middle of the night to switch the two saplings. Coolidge was never the wiser, and the young Sea Island Company dodged a faux pas. Appearances are important at The Cloister. To achieve the appearances demanded by Jones’ vision, a team of artists, artisans, architects, craftsmen, designers and an army of specialized materials providers were assembled to build a new hotel that seems to have been at home on Sea Island since Spanish explorers and clerics came ashore from their galleons four centuries ago. To furnish the 100 guest rooms and public areas of the new Cloister, interior designer Pamela Hughes – from McLean, Va. – purchased 3,000 items collected from throughout the world by Los Angeles antiques dealer Tom Raynor. Urns, tables, chairs, cupboards, chandeliers and other appointments were being assembled a year before the old structure was even set to come down. Entire villages in the mountains of Turkey were commissioned to weave by hand the 670 rugs that now grace the The Cloister’s floors. Willis Everett, a Meriwether County timber detective – what else can you call a man who finds lumber that has been missing for more than 100 years? – was given the daunting task of locating the wood from which to recreate an interior that accurately reflects the look and feel of the original Cloister, built when wood was still wood, stronger and more striking in appearance. Everett, the owner of Vintage Lumber Sales, scoured the river bottoms of the South where logs from trees as old as 1,000 years had rested since they were felled more than a century ago. The rivers and lakes that held these logs acted as a kind of freezer, preserving the wood as it was when loggers cut it down with double-sided axes and two-man crosscut saws. Everett also rescued the planks of ancient buildings to amass the wood Jones demanded. Wood is a particular passion for the Sea Island Company CEO. And the look and feel of his creation is a collage of cathedral, palazzo and theater. A visitor standing in the generous expanse of the main lobby sees a room whose walls seem to soar upward toward the high arches of a distant dome. It is an illusion. The columns that appear to support each rising floor are built on a diminishing scale as they rise, implying to the eye, and thus the brain, a growing distance that is not truly there, a device common to Broadway set designers and made necessary by building height restrictions on Sea Island. “This is like a stage,” says Jones, with a wave of his arm around the lobby. “The performers are the employees and guests. Everyone is a part of the production.” And there is the other effect. “This building deserves a lot of reverence,” Jones says. “You are a little more reverent than you might normally be. I feel that way. I wouldn’t feel right coming in here in boots and jeans and a camouflage shirt.” This Cloister, like the first one, will have codes of conduct and dress that Jones believes are as important to preserve as the appearance of the building itself. The two generations of Cloisters, Jones says, have served generations of guests with inherited tastes that Sea Island Company marketers, led by the Jones vision, have carefully catered to. This unique market niche is composed of people with a disposition toward gentler times when language, manners and dress mattered. It is a clientele that finds style and quality an important part of life and, in many ways, is deeply connected to the past. The Cloister is the time machine that can take them there. To build the vision in his soul, Jones chose Peter Capone of Peter Capone Associates of Santa Ynez, Calif., and Sea Island. Capone’s task was to design the hotel that original architect Addison Mizner would have built were he alive today. 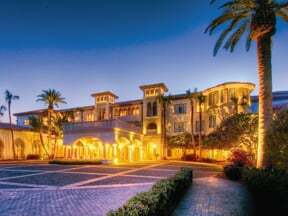 What Mizner would have built is so firmly planted in the Jones vision that it seems divinely delivered. One bow to Mizner was Jones’ decision to dismantle the Spanish Lounge in the old Cloister piece-by-piece, carefully store the pieces, and put them all back together again to recreate an almost perfectly historically correct modern version of the popular public room. The Cloister has a reputation for service that appeals to its guests, many of whom are part of families that have stayed at the old hotel for generations. Odds are those generations were attended by generations of staff members. Jobs at this venerable resort seem to be handed down from parent to child, like a family heirloom. Excellent working conditions, pay that’s well above average and guests who value attention to detail in the service they receive, have combined to make employment at The Cloister a valued prize. So it was no surprise that when word went out that job fairs would be held to hire 200 people to help staff the new and improved Cloister, more than 1,500 people showed up to apply. They soon learned that getting a job at The Cloister requires quite a bit more than filling out the standard paperwork. Applicants must go through “four, five, maybe six interviews,” says Sea Island Company CEO Bill Jones III. Interviewers then compare their notes, review the applicant’s work history and make a committee decision. “We are looking for people who have a heart for service,” Jones says. The Cloister’s reopening will mark a significant point in the Sea Island Company’s history, a satisfying contrast to the first layoffs in the firm’s history following the 9/11 terrorist attacks, when travel and tourism were down. “We had to take some steps we didn’t want to do,” Jones recalls. The world will know soon enough. The official opening is scheduled for October.